The NFL. If you’re not watching it, you’re at least aware of it. The fans demand it, some more than others. This week’s most demanded games feature some teams ready for the playoffs, some not so ready and Tebow. Coming in at No. 5 is a divisional matchup between the struggling Cleveland Browns and the Pittsburgh Steelers at Heinz Field. Just looking back to last week, this one could get ugly pretty quick. The Browns looked awful against Baltimore, while the Steelers did anything they wanted against the Cincinnati Bengals. Pittsburgh can clinch a playoff spot with a win here, so look for them to try to run all over the Browns the way the Ravens did in Week 13. Ticket prices for the game are averaging $158 today, but listings are available on SeatGeek for as low as $41. Our No. 4 game between the Indianapolis Colts and Baltimore Ravens makes another appearance for the winless, sans Peyton Manning squad. But it’s not surprising to see high demand whenever the Colts return to Baltimore, especially if they’re likely to be crushed. With the season all but lost and 0-16 a very real possibility, it’s looking more unlikely we see Manning risk further injury by attempting a return. Tickets are averaging at $164 right now, but fans can still find listings on SeatGeek for as low as $71. The No. 3 most demanded game this week is a showdown between a banged-up Chicago Bears squad and Tim Tebow’s Denver Broncos at Mile High. With talk this week of possibly bringing in quarterbacks Donovan McNabb and Brett Favre to take over for a struggling Caleb Hanie, the Bears look to be in serious trouble. Compounded by the loss of leading rushing Matt Forté to an sprained MCL and we could be looking at a horrendous offense trying to compete against the much-improved Bronco’s D. Tebow is now a win away from leading his team to a 7-1 record, pretty impressive considering the flak he’s caught his entire profesional career. 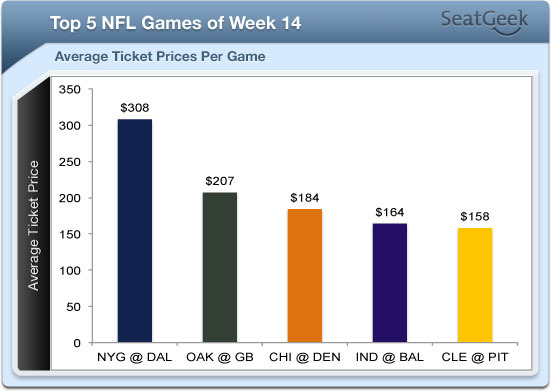 Ticket prices are averaging $184, but fans can find listings on SeatGeek at starting at $113. Our second most demanded game this week isn’t much of a head scratcher. After pulling out a gutsy win on the road against the New York Giants in Week 13, the Packers are back at Lambeau to face the Oakland Raiders. At 7-5 the Raiders are actually having a much better season than many could have imagined after losing starting QB Jason Campbell for the season. An early move to acquire Carson Palmer from the Cincinnati Bengals looks to have been the right one. Tickets prices are averaging at $207 right now with ‘get in’ prices starting at about $144 on SeatGeek. Finally, the No. 1 most demanded game for Week 14 stars two divisional rivals in the New York Giants and Dallas Cowboys. After taking a commanding lead in the NFC East and posting a 6-2 record, the Giants have now dropped games in four straight weeks. But after losing a hard-fought matchup with the undefeated Green Bay Packers in Week 13, the Giants are looking more like they did earlier this season. Dallas is reeling after last week’s loss to the Arizona Cardinals. Cowboys head coach Jason Garrett has been brutalized by the media after calling a last second timeout that neutralized what would have been a game-winning field goal for Dallas. Tickets prices are averaging a league-high $308, but fans can still find listings on SeatGeek starting around $140. General admission tickets can be had for as low as $30.